This entry was posted in episodes and tagged aniyia, blu, dwele, episodes, full crate, innosphere, j davey, jimmie reign, kenny keys, lausd, mar, muhsinah, nina rae, ratatat, soultronica, suhburb, the foreign exchange by dex digital. Bookmark the permalink. Hey Dex, great episode! I really dug the track selection. Great music, wonderful artists. I REALLY liked the new group, Innosphere. I’m a huge Kenny Keys fan, and its good to see him back on the music landscape with a new and different project. Keep us posted on whats happening with Innosphere!! Jay – no doubt, fam. Yeah, all I have so far from Innosphere is this joint, but I’m definitely waiting for more from them. They’re apparently so new that they don’t even have a myspace yet. vince78 – that’s weird, it worked okay for me – but just in case I just went in and cleaned up some of the code up, try it again? 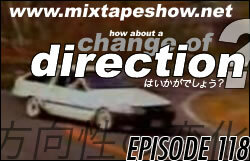 Here’s the direct link: Mixtape Show Episode 11. And wow listening to this now is pretty weird. I barely remember recording this. I think this is just before I left for Alabama. I love the new Innosphere! A little something new…..Keep us posted on new material. vince – oh, I think I misunderstood the problem. I got another email telling me the same thing just now. I fixed it though, everything should run right. DigiGirl – whoa. Yeah, so far all I’ve got is kenny’s myspace, but if I get more material I’m digging, you’ll know where to find it. wow. Looks like iTunes also sent the wrong episode out to a few thousand people. Somehow I forgot the “8″ in “118″, and it sent everyone episode 11. That’s sort of embarrassing. Anyway, I think I’ve fixed it now. Hit the “update” button in your iTunes/podcast download client, and feel free to delete the blast from the past. why you aint shout me out in every show? i thought that was what i paid you for? but i appreciate you keeping me underground. i love this show tho. o to the u – #2 isn’t? I’ve had it for too long to remember. I also don’t remember seeing any checks from you. Might want to get on that. This episode was maaaad pretty, you going soft Dex? you been doing alright ? Yo Dex- you did work on this one fam!! Alright i bug you anymore about the Soultronica saga> however, stop sleeping on the t-shirts!! Jimmy – yeah man, just been getting back into the swing of things out here! LiBM – Last song mighta been outta place, but it’s definitely really dope to me. I guess it helps if you listen to the original Roberta Flack (or even T.I.’s What You Know About That) beforehand, though. And yeah, while I can’t really compete with what 3009 dex digi and brotherton do, putting stuff like this together is definitely pretty fun. T the Pirate – haha, feel free to keep bugging about it, I been waiting on it myself! And trust me, I’d love to have tees myself, but a) I have a hard time believing anyone would want em and b) you sorta have to have a design/logo, which I don’t! that full crate is the illest!! im tryin to find more of him and fs green…great combo of talent!! this that kinda vibe that if i were still blowin tree’s i’d def blaze one to this!! Long time listener… First time poster! That first track is like… Passing through the light of the ages. A love story so timeless… Young as it is beautiful, and old and wise as the redwood that stands so strong. Music for the new world and souls old & young alike. I’m digging this site, from all the way out here hip hopping down under.